Tap: A nummer 4 train made up o R142 caurs enters the Fordham Road station. Bottom: An E train made up o R160A caurs waits for passengers at the 42nt Street – Port Authority Bus Terminal station. 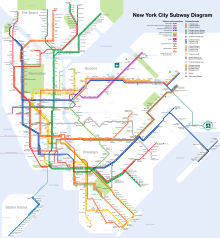 The New York Ceety Subway is a rapid transit seestem ained bi the Ceety o New York an leased tae the New York Ceety Transit Authority, a subsidiary agency o the Metropolitan Transportation Authority. It is the maist extensive public transportation seestem in the warld bi nummer o stations, wi 468 stations in operation (421, if stations connectit bi transfers are coontit as single stations). The New York Ceety Subway is an aa ane o the warld's auldest public transit seestems. Oweraw, the seestem contains 209 mi (337 km) o routes, translating intae 656 miles (1,056 km) o revenue track; an a tot o 842 miles (1,355 km) includin non-revenue trackage. In 2012, the subway delivered ower 1.65 billion rides, averagin approximately 5.4 million rides on weekdays, aboot 3.2 million rides on Setturdays, an aboot 2.5 million rides on Sundays. Bi annual ridership, the New York Ceety Subway is the busiest rapid transit rail seestem in the Unitit States an in the Americas, as well as the sevent busiest rapid transit rail seestem in the warld; the metro (subway) seestems in Tokyo, Seoul, Moscow, Beijing, Shanghai, an Guangzhou record a heicher annual ridership. It offers rail service 24 oors per day an every day o the year. ↑ 1.0 1.1 1.2 "Subway and Bus Ridership Statistics 2012". New York Metropolitan Transportation Authority. Retrieved April 2, 2013. ↑ "Facts & Figures". www.nycsubway.org. Retrieved December 21, 2011. ↑ Hood, Clifton. 722 Miles. Baltimore, MD: Johns Hopkins University Press, 2004. ↑ "New York City Subway & Path". www.urbanrail.net. Retrieved November 7, 2010. ↑ New York State Comptroller. "A Guide for Evaluating the Metropolitan Transportation Authority's Proposed Capital Program for 2000 Through 2004". www.osc.state.ny.us. Retrieved July 7, 2008. ↑ "MTA: Subway Ridership At Highest Level Since 1950". NY1. April 10, 2012. Retrieved April 11, 2012. ↑ "(New York City) Subways (Facts and Figures under title of Annual Subway Ridership)". MTA.info. April 2, 2013. Retrieved April 2, 2013. ↑ "How to Ride the Subway". Retrieved November 17, 2013. This page wis last eeditit on 18 Mairch 2018, at 22:42.